Armand Gamache looked down at his plate. Empty. All the wonderful food gone. He was sure it must have been delicious, but he couldn’t remember eating a single bite. After a dessert of raspberry and chocolate mousse they went home. 1. Break up or chop the chocolate into small chunks. Melt the chocolate and butter in the top of a regular or improvised double boiler (set a heatproof bowl into a saucepan; the size of the bowl should be large enough to easily hold the chocolate, fit the top of the saucepan, and keep the bottom of the bowl at least 2 to 3 inches above the water). Stir occasionally until the chocolate has completely melted, about 10 minutes. Keep the water at a bare simmer. 2. Remove the chocolate mixture from the heat and beat in the egg yolks, one at a time. Beat the egg whites in a separate bowl with an electric mixer just until they hold soft peaks. Fold the egg whites into the chocolate mixture, one-half at a time, using a rubber spatula. Fold gently, making sure to scrape the bottom and sides of the bowl. Stop folding when the whites have been halfway incorporated into the chocolate. Whip the 1 cup of heavy cream with an electric mixer just until it holds soft peaks. Add the liqueur to the chocolate mixture. Fold in about three-quarters of the whipped cream just until no white streaks remain. Set 12 raspberries aside. Mash the remaining berries into the reserved whipped cream until the cream takes on a light pink color. 3. Spoon about ⅓ cup into a champagne flute or other tall, clear glass (a white ramekin will work in a pinch). 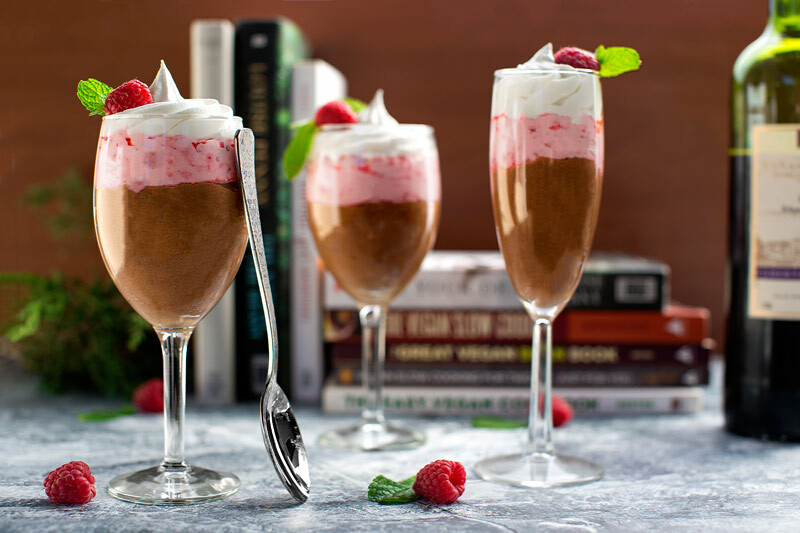 Spoon in a tablespoon or so of the raspberry cream, and then top up the glass (or ramekin) with another ⅓ cup of mousse. Cover each serving with a small piece of plastic wrap and refrigerate until completely set, at least 3 hours or up to 1 day. Serve with additional whipped cream, if you like, and a couple of the reserved fresh berries. Note: Eating raw eggs may lead to foodborne illness. You can reduce the risk of illness by washing the eggshells before cracking them. In any case, pregnant women and those with compromised immune systems should refrain from eating raw eggs. I believe the salmonella is inside the egg. Eggs sold in grocery stores have been washed with a mild bleach solution to kill e coli. however a recent report says that the risk for contracting salmonella poisoning from raw eggs is very low so probably not something to worry about anyway. Also, if you are able to purchase eggs from a farm that has free range chickens, you are less likely to be exposed to salmonella. It is inside the eggs because of the way some chicken farmers raise their chickens in confined spaces. “Battery cages commonly hold 5–10 birds, and each chicken may be given an amount of floor space equivalent to less than a sheet of letter-size paper.” It is no wonder there are disease problems. My mouth is drooling… simply drooling. I make a lemon mousse for hot summer desserts, but now I’ll have to try this one. Thanks so much for posting this, Louise! Cheers. J’en ai l’eau à la bouche! Cette mousse sera sur notre table très bientôt. Merci bien Louise pour cette belle recette. You can buy pasteurized eggs that are safer to use. Looks delicious. Haven’t made a mousse in a long time. Time to change that. By the way, to avoid samonella, just put eggs in hot water for a minute to remove this possibility. Doesn’t cook the egg after only one minute. A perfect dessert for my book club! We are huge fans and have read all the Gamache books.